Univ Of Minnesota Press, 9780816665587, 224pp. Laurie Hertzel wasn't yet a teenager in Duluth, Minnesota, when she started her first newspaper, which she appropriately christened Newspaper. Complete with the most sensational headlines of the day-MARGO FLUEGEL HAS ANOTHER BIRTHDAY!-and with healthy competition from her little brothers and their rival publication, Magapaper (a magazine and a newspaper), this venture would become Hertzel's first step toward realizing what her heart was already set on: journalism as her future. 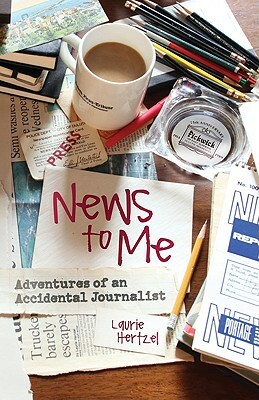 News to Me is the adventurous story of Hertzel's journey into the bustling world of print journalism in the mid-1970s, a time when copy was still banged out on typewriters by chain-smoking men in fedoras and everybody read the paper. A coming-of-age tale in more ways than one, Hertzel's eighteen-year career at the Duluth News Tribune began when journalism was a predominantly male profession. And while the newspaper trade was booming, Duluth had fallen on difficult times as factories closed and more and more people moved away. Hertzel describes her climb up the ranks of the paper against the backdrop of a Midwestern city during a time of extraordinary change. She was there during major events like the Congdon murders, the establishment of the BWCA, and the rise of Indian treaty rights, and eventually follows the biggest story of her life to Soviet Russia-and completely blows her deadline. Written with the insight and humor of someone who makes a living telling stories, News to Me is the chronicle of a small-city newspaper on the cusp of transformation, an affectionate portrait of Duluth and its people, and the account of a talented, persistent journalist who witnessed it all and was changing right along with it-whether she wanted to or not. (Oh, Newspaper doggedly outlasted the full-color Magapaper). Laurie Hertzel grew up in Duluth, Minnesota, and spent nearly twenty years at the Duluth News Tribune as a newsroom clerk, librarian, copy editor, beat reporter, feature writer, news editor, and columnist. Her journalistic work has won numerous national awards, and her short fiction was honored with the Thomas Wolfe Fiction Prize. Currently books editor for the Minneapolis Star Tribune, Hertzel is coauthor of They Took My Father: Finnish Americans in Stalin's Russia, also available from University of Minnesota Press.